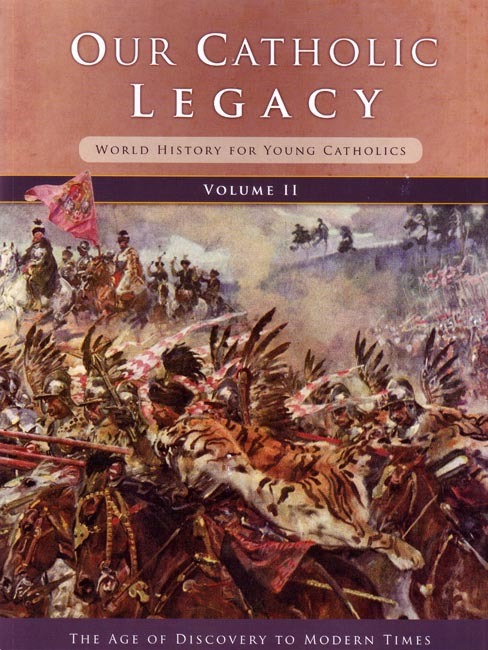 Our Catholic Legacy, Volume II (World History for Young Catholics) is the newest edition in Seton's History series. It is the second of an exciting and colorful two volume world history series from Seton. Filled with over 200 full color maps, charts, and descriptive graphics Our Catholic Legacy Vol. 2 is the kind of exciting history book that you have come to expect from Seton. Answer key in back of book. Copyright 2012. 8.5 x 11 inches. Softcover. 360 pp. When Volume I of Our Catholic Legacy ended, Catholic Europe stood on the precipice. Momentous events were about to unfold that would change the world forever. In Spain, two Catholic monarchs finally freed their kingdom from Muslim invaders after a war that lasted 770 years. When that war concluded, they sent a man named Columbus on history’s greatest voyage of discovery. He discovered nothing less than a New World. Yet, at this time of great triumph, Catholic Europe was about to be torn apart. In Germany an Augustinian monk named Martin hammered 95 theses to a church door. His nails would serve not to build but to destroy. These two world changing events are only where our story starts. We will follow the story of the Protestant Revolt and its impact on Europe. We will see how the nations of Europe each reacted to the Revolt. We will also study the true Reformation, when the Catholic Church tries to bind up the wounds caused by Martin Luther’s nails. Then we will return to Spain, the most loyal daughter of the Catholic Church, the one nation where the Protestant Revolt never gained a foothold. From Spain, missionaries will go out to the New World to evangelize. Conquistadors will go to conquer and colonists will go to build a new civilization. As missionaries risked their lives in far away lands, English Catholics were risking their lives at home where it was against the law to be a Catholic. Yet, Jesuit priests, trained in France, crossed the English Channel in disguise to bring the Sacraments to their fellow English men and women. As these brave priests stepped off the ships on English soil, many were taking their first steps to the gallows. Then the scene will shift to a Cardinal who worked against the Church. Cardinal Richelieu was determined to make France the strongest nation in Europe. He was willing to sacrifice anything to achieve his goal. By the time the Thirty Years War ended, the ideal of a Catholic Europe had also ended. It was a terrible price Richelieu paid, but France was and would be the strongest nation in Europe for the next 170 years. Yet France would experience horrors that few nations have ever had to suffer. France would endure the icy blackness of the French Revolution and its Reign of Terror. However, during these dark days heroes would emerge. In a part of France called the “Vendee,” the Catholic and Royal Army, led by a simple peddler nearly defeated the forces of the Revolution. All over France priests and nuns went to their deaths praying for their murderers. Many of these religious would later be canonized. One of the last groups to be killed were sixteen Carmelite nuns. During the 90 minutes it took to kill the nuns, the normally screaming crowd was so quiet they could hear the nuns praying on the scaffold. The French Revolution created an opportunity for a young military genius named Napoleon to become ruler of France. Napoleon Bonaparte would come to power after the Revolution and seek to conquer the world. Sadly for the world he was the greatest general to walk the earth since the days of Alexander the Great. The British Navy and the Russian winter finally defeated him. During the remainder of the 19th century world leaders worked at peace. Sadly, too often they failed. The worst failure came in August 1914, when the world was embroiled in one of its most horrific wars. World War I caused appalling destruction. When it was over, a demonic shadow loomed in the East: the Soviet Union. The Communist monster threatened to devour the world. Once the Communists consolidated power in the Soviet Union, they struck like a serpent. Thinking Poland easy prey, the Communists launched an attack against the Poles. Yet since the time of Polish King John Sobieski, who saved Europe from the Turks, the Poles had been forged in the fire of battle and were made of steel. In 1920, at the Battle of Warsaw, the Poles defeated the mighty Soviet army. For a while Europe was safe. In Spain, the Catholics there were called upon to fight a last crusade. From 1936-1939, Spanish Catholics fought the Communist monster that sought the utter destruction of Catholic Spain. Spanish Communists murdered thousands of priests, nuns, and religious in the one of the greatest persecutions in the history of the Church. By the grace of God, the Catholic forces in Spain were victorious. In the last chapters of the book, we will study World War II and the Cold War. We will learn why you can not trust a crocodile, why you can never trust Communists, and why almost everyone trusted a humble priest from Poland. Finally, the book concludes with a chapter on the Middle East and the War on Terrorism. These two volumes of history are called Our Catholic Legacy, because a legacy is a gift that one generation gives to another. The greatest gift that anyone can give is the gift of the Catholic Faith because it is the gift of eternal life. Our Lord has handed down our Catholic legacy. He gave it to His Apostles who passed it on. This book is the story of some of the great men and women who have glorified that legacy. Many suffered and died to preserve this legacy. This book has been written specifically for the 7th grade but also can be used by 6th and 8th graders. At the end of each chapter there are fill-in-the-blank questions that serve as chapter reviews. The first two chapters of the book are on-line and can be downloaded. For those enrolled in the 7th grade history course who want to use this book there are lesson plans, parent-graded tests with keys, and tests to send into Seton for grading.